A toy company launched "Smash-Me Bernie" at the industry-only Toy Fair this week in New York. 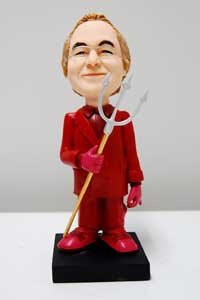 The pitchfork-wielding doll was created in Madoff's likeness, complete with a red devil suit. A hammer is included with purchase, so you can smash Madoff—who was arrested in December after confessing to a $50 billion Ponzi scheme—indefinitely.